Ladies fashion rings and bands are very popular and although they are made from gold and platinum are not very expensive. Advances in the jewelry manufacturing process have brought down the price of the rings and bands significantly. These type of rings and bands are bought by all women who wish to look trendy without spending a fortune. To be honest, fashion rings and bands are all about reintroducing the traditional designs of jewelry with a tinge of style and sophistication - by spicing them with the right contemporary hues and selling them at affordable prices. There is a great selection of gorgeous rings and exquisite bands in fabulous colors and designs - ranging from traditional to contemporary. Some of the ladies fashion rings include plain bands, diamond encrusted bands, tension set bands and other unique designs. The most common material for rings and bands is of course gold because of the ease of which the metal can be worked with and also the beauty that the metal possesses. It can be made to suit any occasion and match any style of dress because it can be made in the classic yellow gold color or in the more modern white gold color. Most white gold is rhodium plated to protect the gold and to give it the shiny white metal color. Although this rhodium plating is very thin and may wear off over time, it can be reapplied at any time at a very minimal cost. White 14k gold is most popular right now probably because that color matches most other jewelry a woman would wear. There is jewelry and bands that can be made out of other materials but they are generally cheaper jewelry that is not expected to last very long. Quality jewelry like you find at Novori Jewelry is made from the finest gold and platinum so that the jewelry can become an heirloom and be past down to members of the family or close friends. Novori Jewelry is worked using the latest CAD and computer technologies but is also worked on by skilled jewelers that have been trained and honed their skills for many years. Rings and bands made by Novori Jewelry are not made overseas or imported as some of this imported jewelry uses substandard materials. 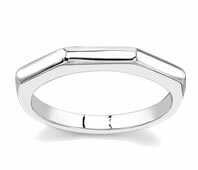 Novori rings and bands are always made in the USA and have the finest materials. We guarantee everything we sell. Women wearing fashionable rings and bands will psychologically feel like they are wearing some expensive jewelry and it is also a fact that these accessories, though not priced very expensive, are attention grabbing. 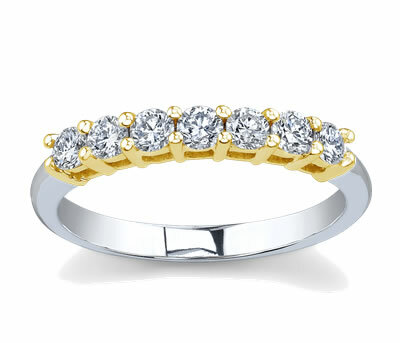 Ladies fashion rings and bands are also given as gifts on birthdays and other important occasions. Trends in ladies fashion rings and bands keep changing in accordance with the changes in fashion clothing. However, certain rings like the ones with the heart sign and clasping hands are always in style and make a perfect gift. Bands with these symbols signify eternal love and romance and are worn by both men and women throughout their relationship. Heart shaped rings are in demand during Valentine's Day. Some women deliberately choose dainty fashion rings with love signs to show their passionate their partners. 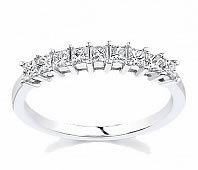 Fashion rings with diamonds are affordable by all. Remember that these rings and bands are worn almost every day and that when they are made of quality materials like gold or platinum, they will be able to withstand the rigors of every day wear and tear. Cheaper materials may not be able to withstand the bumps and scratches a ring takes on a daily basis. It must be said that all women love to dress up and wear elegant stylish accessories regardless of their age. The yearning to look gorgeous and demand attention is indeed a part of female psychology and the market for jewelry, rings and bands allows for this. Fashionable women spend a lot on these types of accessories and with the help from Novori Jewelry are able to save money when buying diamond rings and bands.